The magic found in the Tome of Eternal Darkness is inherently alien and requires a lot of work on the players' part. While materia gave Final Fantasy VII's characters convenient access to magical powers, the Tome forces player characters to wander horrifying locales and fight off eldritch horrors in search of runes. Most games utilize spells like "Heal" or "Cure" to recover from injuries. In this game, players get this effect from combining the runes "Santak", "Narokath", and "Chattur'gha". The first two runes align with the concepts of "Self" and "Environment", which means they draw energy from the environment into the player character. The third rune is the name of one of the Lovecraftian horrors and determines if the spell affects the body, the soul's capacity for magic, the mind, or some combination or inversion of the three. The rune system ties into the game's sanity system by forcing players to approach common concepts through the paradigm of an ancient monster. Unlike the materia system, the Tome's magic has immediate negative consequences. The game offers twelve playable characters and nearly all of them encounter the tome and subsequently suffer a horrible fate. Both Alex and the players learn that sanity and survival are the price for using the tome, which creates an uncomfortable sense that Alex is not going to survive the final chapter of the game without a straight jacket. Like the characters, players must learn the alien language of the elder gods, so once again the magic system creates sympathy between the hardships of the characters and the players who control them. A very different approach to magic is through the lens of advanced technology. Arthur C. Clark's famous adage that sufficiently advanced technology is indistinguishable from magic perfectly describes Xenosaga's Ether system. The Ether system relies on a universe-wide network of computers that make it possible to instantly transfer data and machinery across almost any distance. Characters can use the system to simulate traditional magic effects like fire and ice spells, but they're also free to call in giant guns and robots with the wave of a hand. Super science also emulates time travel by letting characters revisit destroyed or lost areas through a variation of The Matrix. Traditional magic explains how a given world works to a player. 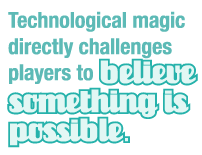 By contrast, technological magic directly challenges players to believe something is possible. Normal magic has rules beyond our comprehension, but magic that assumes a scientific basis pushes against rules we're already familiar with. Xenosaga takes things a bit further than this by introducing the enigmatic Testaments, who use even more advanced technology. This technology comes off as outright supernatural to our protagonists; savvy players can identify when something impossible even by Xenosaga standards happens, which lets them piece together clues and solve the mysteries of the game faster than the characters themselves. Not all spells come from external sources. Psychic powers, chi, and raw emotional energy are all variations on the magical theme. Reaching deep down and finding a supernatural inner strength provides personal satisfaction, as you're accomplishing something on your own rather than as the pawn of a greater force. But what happens when the power from within is more alien than you think?